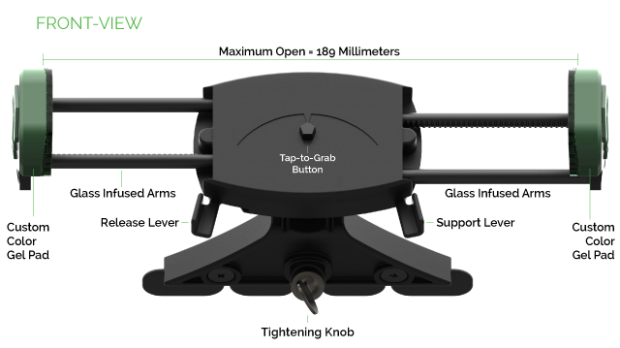 Mountek, famous for its now patented Grip+, has brought to Indiegogo a variation of their very much loved mounting system. Lots of car mounts being sold today either use the vents or a suction cup to hold your device in place. Mountek has brought a different way into the market by using the aging CD players in our cars. This CD blade can then slip into the CD slot and firmly keep itself in place without activating your CD player. The way this California-based company has made the Grip+ is extremely intuitive. There’s a button in the middle of the mount that automatically tightens the clamps once a device is placed on it. To remove your device, you simply need to tap the release lever using your thumb while holding your device. The very clever placement of buttons and levers are so ingenious, it’s difficult to find fault in it. The range of devices you can place is huge. Whether it’s as small as a Go Pro to a full-sized iPad, the Mountek Grip+ can take it without a hitch. If you want more functionality for this wonderful device mount, then you may opt for their Grip Qi version which can charge any Qi-enabled device. The Mountek Grip Qi has everything the Grip+ has, plus Qi wireless charging. Another great thing about this is that Mountek decided to go with the newest version of Qi which features fast charging at 15 Watts. This will surely make those Samsung Galaxy S7 owners very happy. For Qi wireless charging to work, you’ll need a high-speed USB cable or a cigarette lighter adapter to achieve the specified 15 Watts of power. The Mountek Grip Qi is currently available on Indiegogo for $48. You may also head on over there to check their other upgrades such as additional gel pads and a backseat upgrade. With Mountek presently funded at $130,000 with over 4,000 backers, this useful accessory will definitely see itself out in the market in a few months. Before the price hikes up, join the backers to get it at a 40% discount!